Let’s just call a bad hairpiece a bad hairpiece. This mac and cheese looks like it has a chia pet growing on it’s head. I tried to convince my roommate’s boyfriend that it was just growing an extra coat of broccoli-basil breadcrumb hair for the winter, to keep warm, as he stood over the tray with his fork dubiously poised. He remained skeptical. Gave me a look that said “geez louise, everyone knows mac and cheese doesn’t really have hair follicles”. Yes, sometimes even the future doctors of America need to be cajoled in to eating their vegetables. It happens. And while this mac and cheese has quite a few healthy surprises stuffed into it, it’s vastly different from one of those Jessica Seinfeld-esque concoctions in that it’s not pretending to be something that it’s not. It is unapologetically good for you. And it tastes nothing like it’s neon orange counterpart. So if that’s what you’re hoping for – some kind of health food miracle that turns cheddar, gruyere and butternut squash into something akin to velveeta – this is not it. But if what you’re craving is a dish that hits all those cheesy comfort food cravings while still allowing you to feel like you can conquer the world afterwards (or at least shovel a few inches of snow). Then take off those fuzzy boots and your hot pink marshmallow puffy jacket and come on in. I’ll grab you a plate. So, I’m going to take a detour from mac and cheese heaven to ask you a question. If you could eat peanut butter and jelly bars to help find a cure for cancer…would you do it? Guess what….now you can! My friend Amanda from Tales From A Kitchen Misfit is training for her FIRST marathon (the Boston Marathon!!) 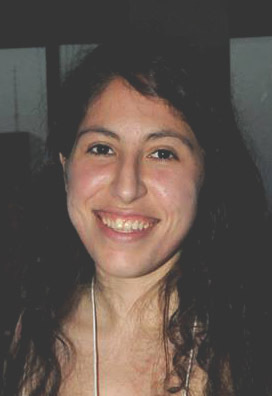 with Team in Training, and is having a virtual bake sale to help her meet her fundraising goals and raise money for the Leukemia and Lymphoma Society. I’ve done three seasons with Team In Training so I know it’s a worthy cause. The money that Amanda raises from the bake sale will go to cancer research (some of the work that I’ve done in labs has actually been funded by LLS so YES this is going to REAL research) as well as to help patients cover costs of treatment and hospital care. Along with a number of other treats, my peanut butter and jelly bars are up for grabs! If you’ve ever wanted to have an Eats Well With Others treat delivered straight to your door, this is the time. You can bid here. And if anyone has any kind of peanut allergies, I’d be willing to make them with sunbutter or soybutter so don’t let that stop you from bidding! Preheat oven to 400 with a rack in the middle. Set a large pot of water to boil. Place the squash on a large baking sheet lined with foil. Spray with cooking spray. Sprinkle with salt and black pepper. Bake for 20-25 minutes or until tender. While the squash is cooking, pulse half the basil, all of the bread, the broccoli, and a bit of water in the food processor until there is a fine crumb. It may be a bit damp. Transfer to a small bowl and rinse out the processor. 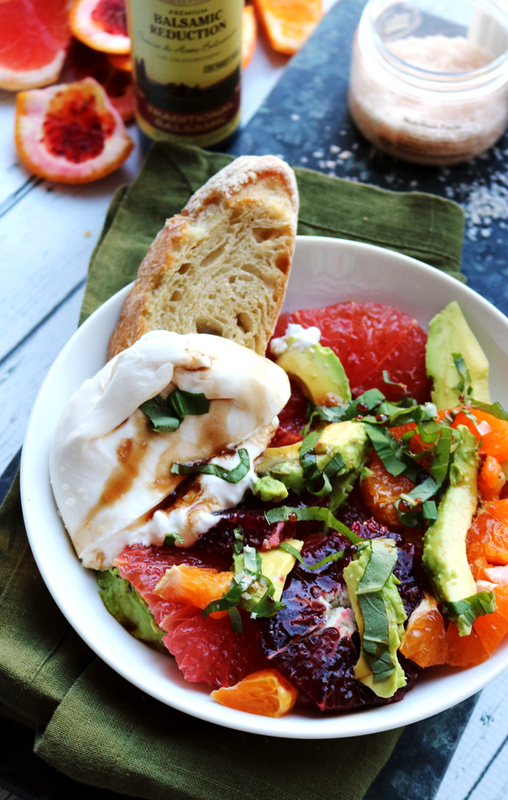 In a separate bowl, combine the Greek yogurt and grated cheeses. Place the cherry tomatoes in the food processor with the remaining basil. Pulse to break things up a bit, then add it to the cheese mixture. 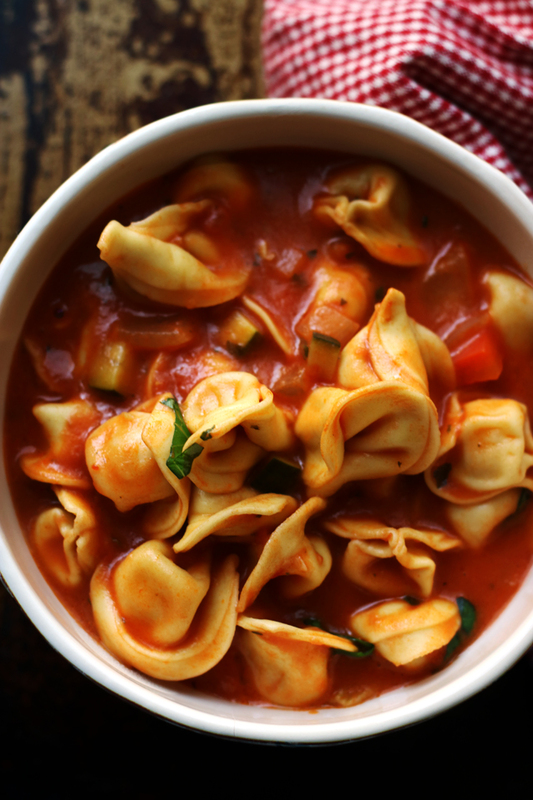 Boil the pasta in well-salted water until it is slightly undercooked. Drain, reserving a cup of pasta water for later use. Put pasta back in pot and add the cheese mixture to it. Add the squash and stir it. Add pasta water until the sauce is thinned to the consistency of cream. It’s okay if it’s a bit runny, as the pasta will absorb the liquid in the oven. Transfer everything to large casserole or 9×13-inch baking pan. Sprinkle the green breadcrumbs across the top and bake for 20-25 minutes or until topping is crunchy. Remove from the oven. Let sit 10 minutes before serving. I am submitting this to Presto Pasta Nights which is being hosted by Emma of Souperior. I kind of despise the vegetarians that only eat pizza and blue box, etc. They give ones like you and me a bad name. Love this topping, it looks delicious. It definitely looks like a chia-head…a delicious chia-head! Ha I have no problems eating dinner that looks like it has a hair piece:-) This sounds perfect! I think you should put the squash in the title somewhere. 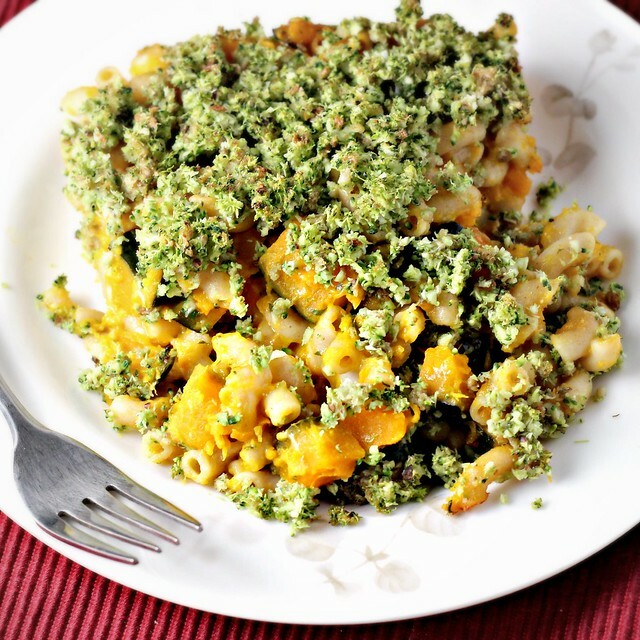 I was a little scared of broccoli mac & cheese, but once I saw the butternut I was all over it! I do worry about vegetarians who aren’t fond of vegetables. Mac -n-Cheese makes me weak at the knees and this version is brilliant. I’m coming over for a heaping plateful and how did you know I had a hoy pink marshmallow puffy down jacket? Scary. My kid has a mac and cheese addiction, this will make us both happy. Healthy Mac and Cheese, count me in, looks fantastic. I’m super into the whole squash in mac and cheese thing. Loving the basil/broccoli. Loving pretty much everything you cook! Your mac and cheese looks divine. And I love those peanut butter and jelly squares! I’m on my way to check out the bake sale. I have been craving mac and cheese lately, but can’t afford the fat calories. This sounds perfect. When I was a child I didn’t even want to hear the word broccoli! If my mother, back then, had made something like this, I would have thrown it to the garbage for sure. Now I simply love broccoli and whenever I have the chance I sneak it into our table. My son, and I am ashamed to say this, had a better approach to broccoli than me. He tried it the first time, he wasn’t thrilled, but he kept trying it until he finally became fan. 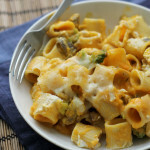 Both I and my son would have loved to have a portion of this lovely veg mac and cheese! Broccoli pesto is one of my favorite things to make… and now I have another wonderful use for it! LMAO! Chia Pet Mac n Cheese. I can not stop laughing at that thought. You never fail to crack me up. This looks great! Now that you mention it, this does look like a chia pet! But I think the hair piece makes it look fun. I’ve never made pesto with broccoli. Basil, spinach, parsley, changing the nuts, yes. Broccoli–no. But I very much dig this idea. We eat a lot of broccoli…nice to have something new. It totally does look like this mac and cheese has a chia pet growing on top of it! I’m sure it is delicious though. 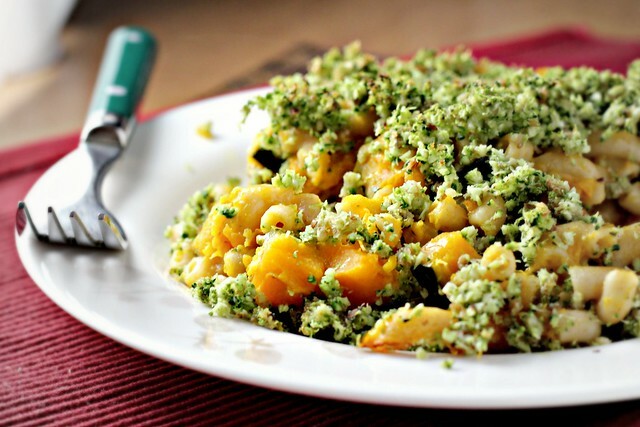 i love the idea of pesto from broccoli! bookmarked! Oh, I think it’s a good hair piece! It sounds really awesome. And I have everything to make it, so…I wonder what the kids would say. I’m going to fool myself and say it’ll be love at first sight 😉 I want some, though! I have fork raised Joanne for this healthified dish. It must be a pasta kind of day! I would love to try your mac and cheese. Can you bring me some? Everything I like is in this dish and I think the little chia head of broccoli is beautful! I am bookmarking this. I may sub some of the cheese for what I have on hand, but I think I have everything else. What a wonderful comfort food meal! Yum, yum! 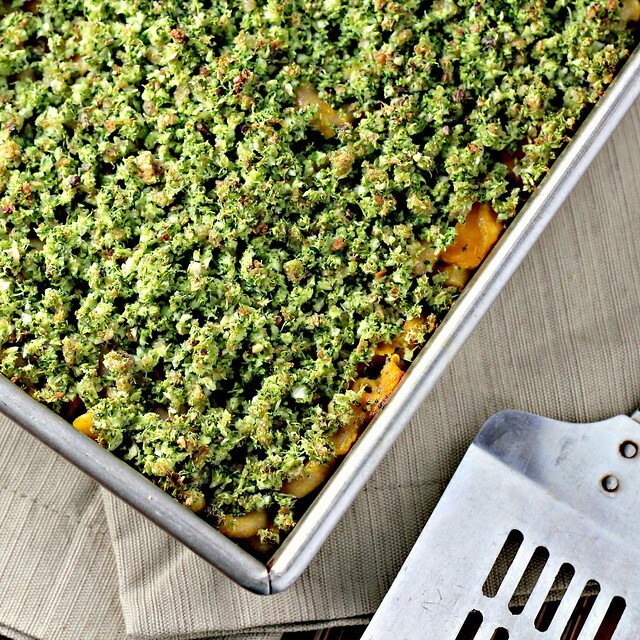 LOVE the look of this broccoli crumb topping! I would add chunks of squash to everything if it wasn’t for my husband’s request to stop going crazy with the squash! 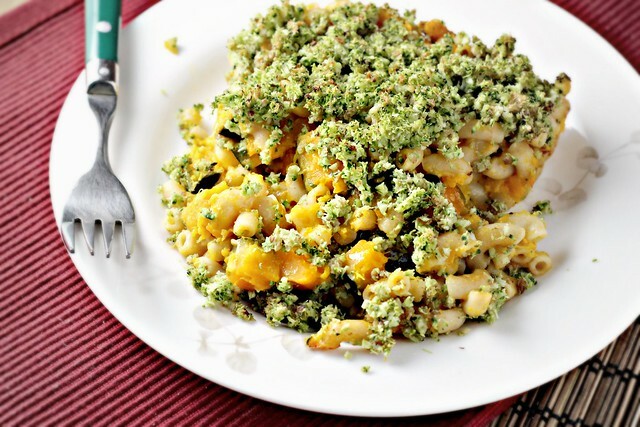 oooh this just might be the healthified mac and cheese recipe i’m looking for! and the green crumbly stuff looks like something else entirely to me (um, what?) but it’s all good, bro. Man I love Mac and Cheese, and that broccoli crumble topping in genius!! I’m game. I’ve always wanted to cook a chia pet. I think it looks amazing! Love the green hair look of it! And it looks extra-healthy. This looks so delish and healthy! Btw, Have you ever considered writing a cookbook? Just. Can’t. Stop. Pinning. Your. Recipes! Some foods do all the work for you…cookies, pie, chocolate. Others need help…soup, bulgar, and ya broccoli. BUT green and orange are so pretty. And I would totally eat this. Loves me some mac and cheese with veggies. omg omg omg. I must try this! Asap. Like now! I usually mix in broccoli with my mac and cheese but have yet to use it as a chia head topping! Great idea, and I love the addition of squash too! My mouth is watering just looking at these pictures. 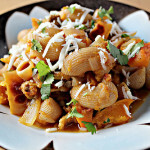 I will have to make this recipe with GF macaroni noodles. My husband is crazy about gruyere! That looks amazing! I would eat that in a heartbeat. I make mac and cheese at least 3x a month – maybe my family wouldn’t mind me changing it up a bit! I love mixing in veggies in mac n’ cheese. 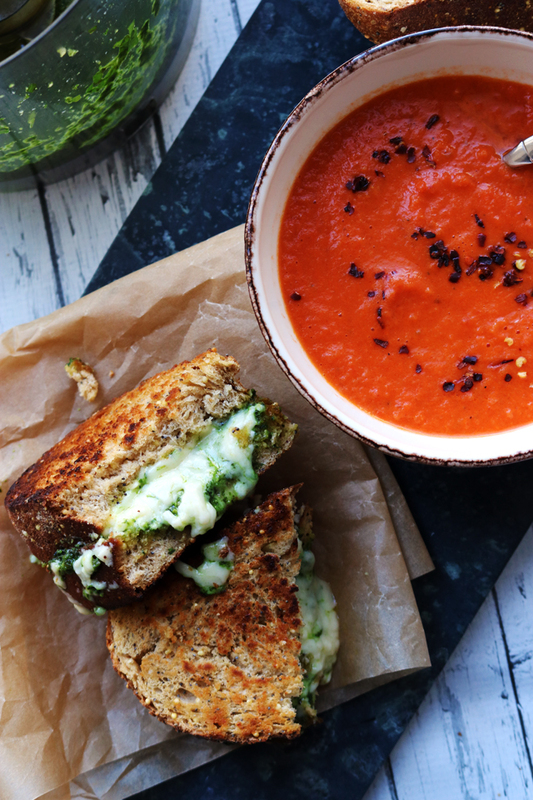 Broccoli is always a perfect choice because it goes so well with cheese. I like to use squash puree, too – but all in one? Looks fabulous! You’ve gotta love Heidi’s delicious and healthy dishes! This looks like a winner, Joanne, hair follicles and all. Normally, I’m very much opposed to any sort of veggie in my comfort food-style mac and “cheese”, but this broccoli version might just make the grade. What a lovely twist on the traditional baked mac’n cheese! Sounds yummy. I saw “broccoli-basil” and knew I’d like it. Then I say “mac n’ cheese” and my heart almost stopped. YUM. Oh my goodness, this sounds absolutely delicious. I can’t wait to try this recipe out. I would never have thought to combine all the ingredients, and yet they’re pretty much all my favorite foods to eat. Thanks for the great recipe! By the way, is there a cheese you think could be substituted for the gruyere? I don’t think I have that one currently in my fridge. This sounds awesome! Love this idea! There are no bad mac-and-cheeses! Way to go, healthifying it with a layer of broccoli, it looks absolutely scrumptious. What a creative and fun recipe…I bet it is just delicious! Count me in! It looks delicious! I finally tried out the Pasta with Creamy Avocado Sauce on my family last night. I told them that it would totally give them super powers and I think they bought it. Of course, throwing in a tiny bit of roasted chicken didn’t hurt. In my effort to make them more healthy, I have to take things slowly with them. While they enjoyed your Spicy Honey Chipotle Chicken with Sweet Potatoes more, they dug in like brave little soldiers and proceeded to eat every bite of the pasta. Yay, Joanne! I think this will be the next green meal to spring on them. Wish me luck! I absolutely love the healthy twist(s) added to it! It’s great that your friend is participating in the virtual bake sale AND the money actually goes into REAL research! Your Mac and Cheese is looking so healthy to me! In fact, nutritious too, esp with the broccoli. And what a wonderful cause you’re donating baked goods to! Very awesome! one for my bookmarks – I love that green glow – sounds like exactly what the doctor should be ordering! That mac and cheese looks awesome! And I’m cracking up over the Chia pet resemblance! The chia topping looks absolutely delicious! I would not hesitate for one moment! I love it and would dig in with gusto. Oh my gosh. This mac & cheese looks incredible. What an awesome combination of flavors! how delicious 🙂 and i’m kind of digging the head of hair on this mac n cheese! Your posts always crack me up! Love this mac and cheese. Sounds wonderful! You seriously made me laugh out loud. I would have never thought of it looking like a chia pet!! Regardless, you can load my plate up – it sounds fab! I think the chia pet effect is lovely-I’d totally hit that mac and cheese. I’m going to check out that bake sale now! 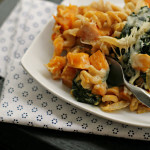 Love this take on mac and cheese especially with the butternut squash. Sounds delicious to me! This sounds amazing and I love that borcolli topping. Tasty. Chockful of sweet, flavorful veggies. The kabocha squash’s color makes it look even cheesier! This mac & cheese is the tastiest looking chia pet I’ve ever seen. YUM! Despite it’s looks, this mac looks like a definite must make (and must eat, of course). this looks delightful. I LOVE mac and cheese and I’m loving this version! 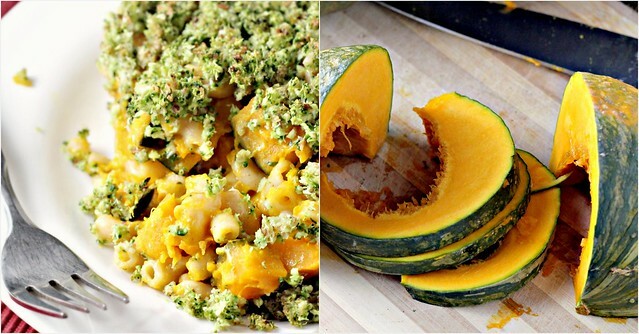 What a great idea to add squash to achieve the color and creaminess without all the calories and additives typically found in nasty mac and cheese. 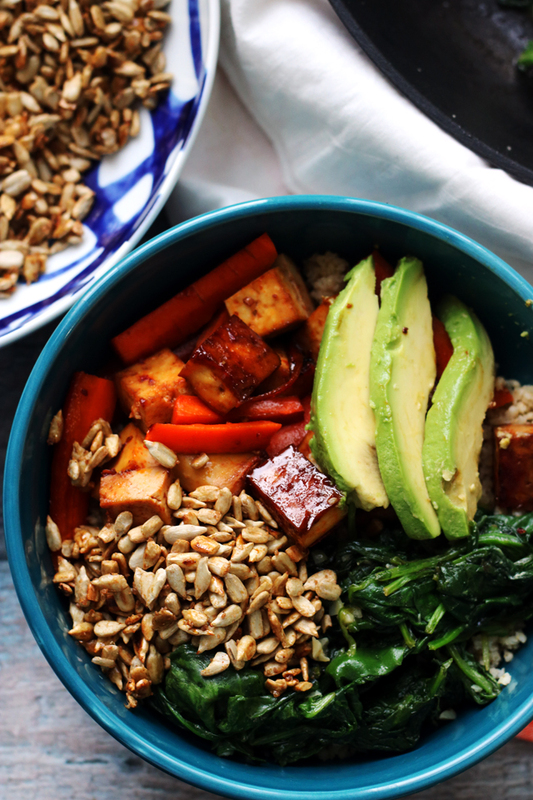 This looks delicious and I like how you sneak in all the healthy bits. Brill girl! I cannot resist mac & cheese! Love the sound of this vegetabled-up version! In pic #3, it looks like it’s covered in marijuana buds. Umm, from what I have seen in pictures….no personal experience of course. How did you know I was wearing a hot pink coat? Dear Joanne, I think this looks delicious. I don’t think it looks like a Chia pet!! I love this mac and cheese! But I love anything with basil in it. 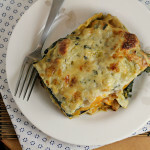 Love this basil-infused broccoli gratin over the Mac & Cheese – delightful! I love this!!! Anything that makes Mac & Cheese even a little bit healthier may be my new favorite. I love how the veggies created such a beautiful crust over that dish. Great post! I only saw stunning photos of glorious pasta until you mentioned Chia Pets! It must be the season for mac ‘n cheese … fineCooking Magazine and Chatelaine had me drooling enough to buy both at the grocery store. Thanks for sharing your version with Presto Pasta Nights. It looks amazing! Hi! Fellow med student at the Cleveland Clinic, LOVE your blog for the fact that I can make just about any of the recipes and not freak out over not being able to see the nutritional info, because I know if you say it’s healthy, you haven’t sneaked in a load of super-sneaky-bad-for-youness while we weren’t looking. I’m new to this whole art of cooking so I have a pretty basic question for you. Our poor-med-student budget doesn’t yet allow for a food processor but I have a blender, smoothie maker, and immersion blender. Would a plain old blender work instead of a food processor, or is there something else I can do in it’s place? 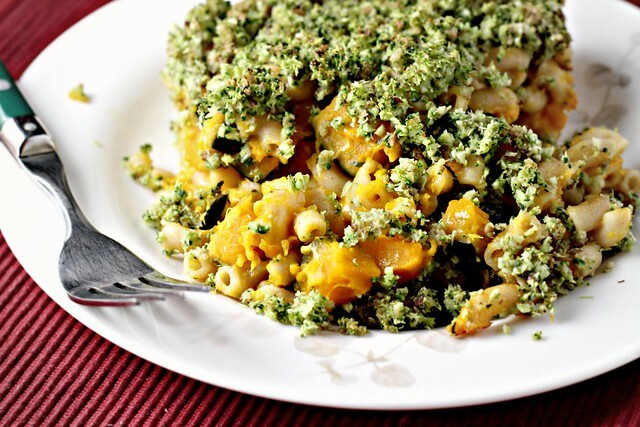 I really like the sound of topping a pumpkin mac n cheese off with broccoli and pesto! Yum! Can’t wait to make this tonight. My 6 year old requested mac and cheese tonight and this should make everyone happy. Oh my goodness – I really need this in my life!